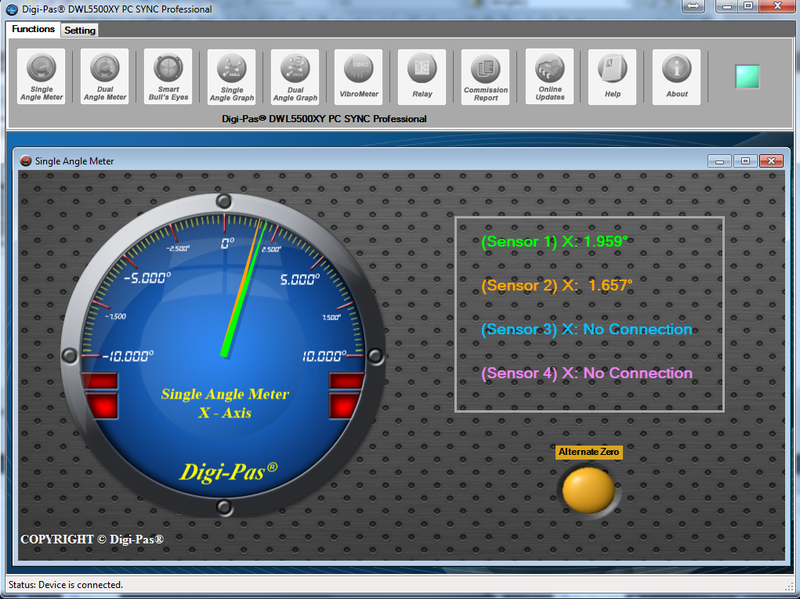 The PC Sync Software is a 'plug & play' interface (embbeded with National Instrument software) instantly enables application engineers to remote access to multiple sensor modules via USB cable/ RS232/ RS485/ wireless Bluetooth connectivity for 2D leveling, tilt angle monitoring, alignment and vibration measurement. User can effortlessly set parameters to sensor modules from remote distance for real-time monitoring, data acquisition and logging purposes. The control box can be attached to external peripheral devices that could thereafter independently operate to trigger relay contacts for activating e.g. siren/alarm, strobe lights or other devices (after PC is detached from the control box). The relay outputs on the control box is user defined to activate any connected peripheral devices in accordance to pre-set conditions. 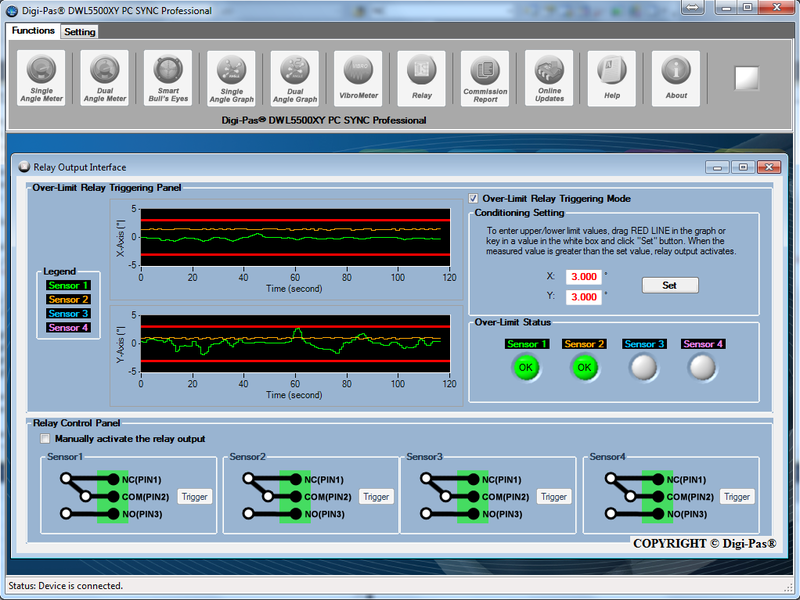 The PC Sync software can be configured to trigger e.g. siren/alarm, strobe lights or other peripheral devices. 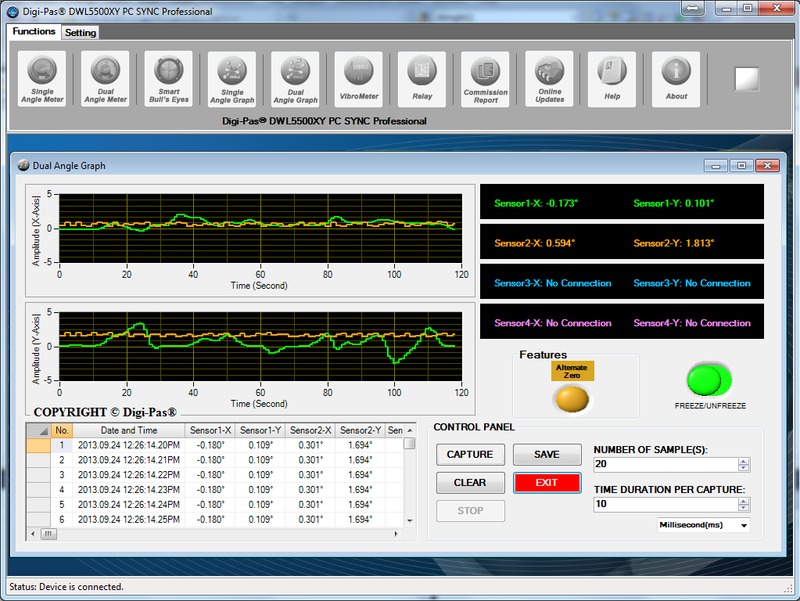 Relay output status and measurement readings of any sensor module are displayed in real-time on PC screen. This feature allows user to view in real-time single-axis angle reading from the selected sensor modules simultaneously in both numerical and graphical display in user-defined units of degree, mm/M or In/Ft. 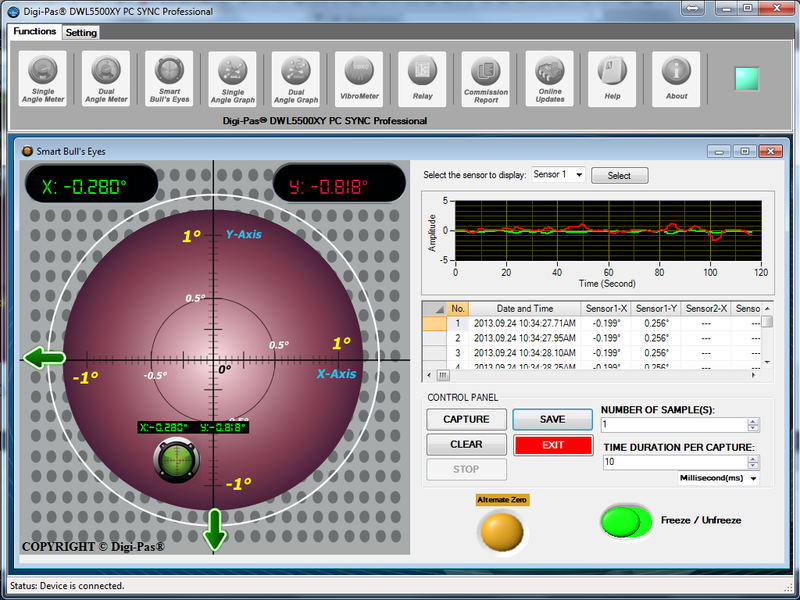 This feature allows user to view and record in real-time 2-axis angles readings from a selected sensor module in both graphical "Bull's eye" (with auto range feature) and numeric formats simultaneously. User may define parameters for data capturing and saved in Excel format for further analysis. This feature allows user to view in real-time dual-axis angle readings from selected sensor modules simultaneously in both numerical and graphical display in user-defined units of degree, mm/M or In/Ft. This feature allows user to view and record in real-time single-axis angle readings from selected sensor modules simultaneously in a line graph scale and numerical readings in unit of degree, mm/M or In/Ft. The data of each sensor unit is represented by different colors of lines in the graph, enabling user to identify and compare real-time results among the connected sensor modules. User may define several parameters for data capturing. The numerical data can be saved in Excel format for analysis. 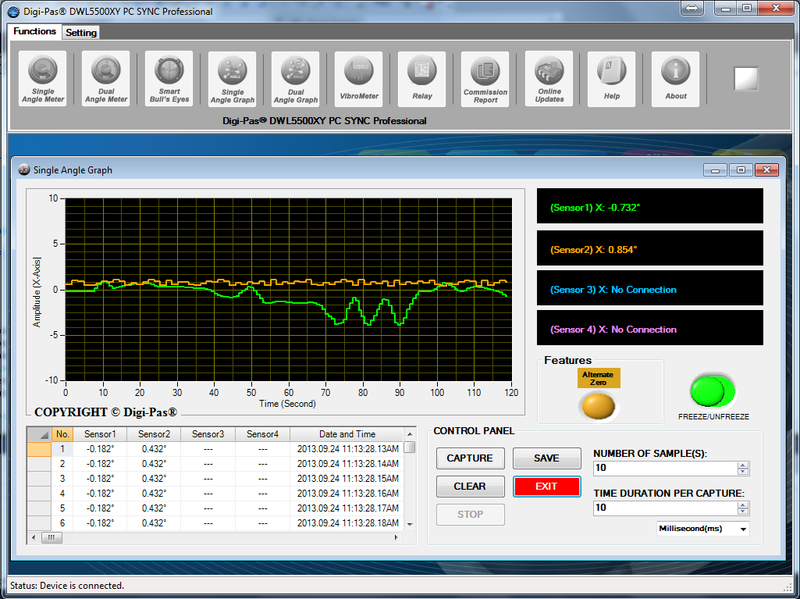 This feature allows user to view and record in real-time 2-axis angle readings from selected sensor modules simultaneously in graphs and numerical formats. 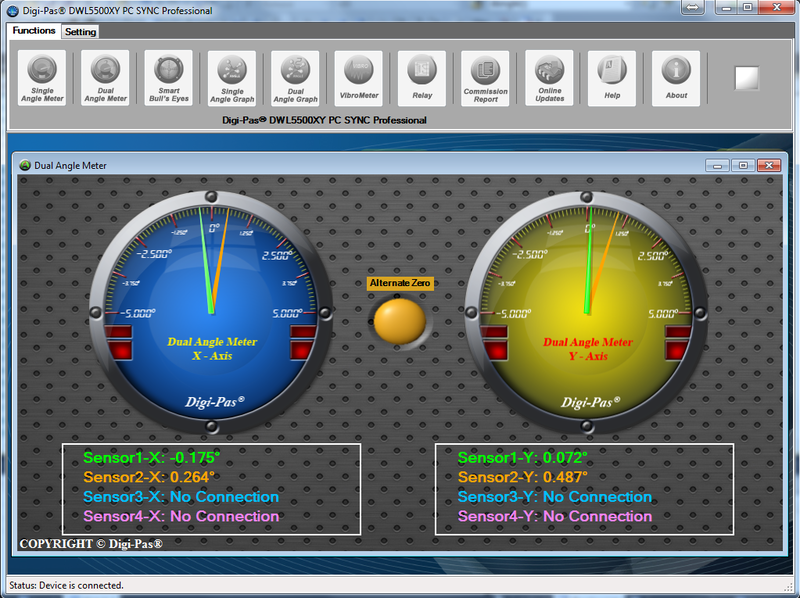 Measurements from all sensor modules are displayed in two distinct X-axis & Y-axis graphs for clarity. User may define parameters for data capturing and saved in Excel format for further analysis. User may monitor and record the object’s leveling-status changes and also their surrounding floor condition i.e. topographic changes over an extended period of time, to identify variation/change pattern and analysis (e.g. due to seasonal temperature & low-scale earthquake) that affect precision component/part production yield, reduce scraps in precision engineering & metrology applications. 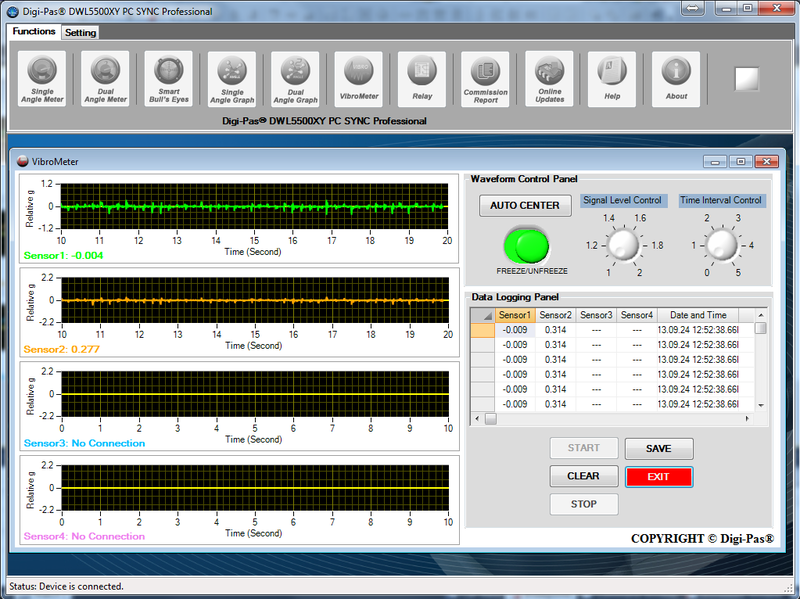 This feature allows user to monitor & record vibration patterns in numeric and graphic forms (sampled at ≤10mS and user defined). There are four vibrographs which displaying vibration patterns captured by each operating sensor modules simultaneously. Vibration caused by improper levelling (i.e. machine uneven footings weight loading and distribution may result in 'rocking') affects accuracy performance of high precision equipment/machines/objects. Vibration monitoring of precision equipment/machines/objects and also their surrounding floor vibration - topographic changes over an extended period of time, to identify vibration magnitude/pattern and analysis to improve production yield, reduce scraps and ensuring sharp/quality image capturing in precision engineering & metrology applications.